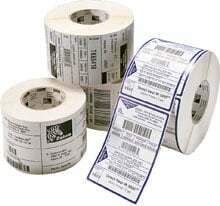 Zebra Z-Select 4000T All-Temp - 2" x 5.50" Thermal transfer paper label. Not perforated. 1,050 labels/roll, 10 roll case. Additional Information: Outer Diameter: 8"
The Zebra 72305 is also known as ZEB-72305-CASE	.